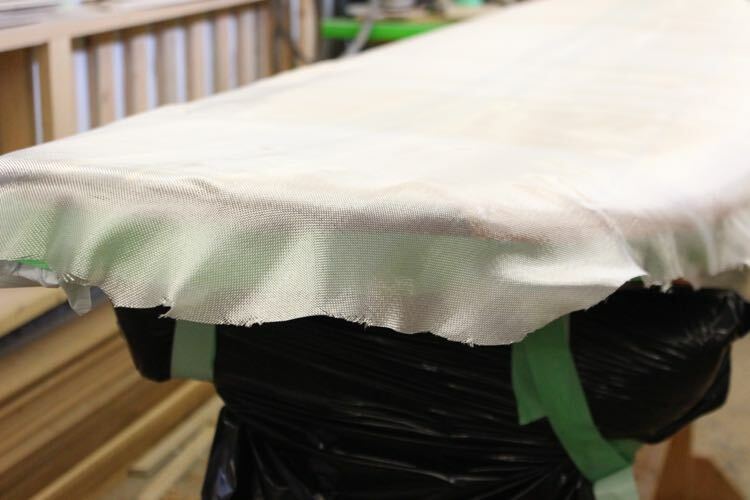 The first step in glassing is to determine how much fiberglass is required. This is called the “glass schedule” and it dictates the final strength and weight of your board. Wooden boards can use a much lighter glassing schedule than is used on foam boards. I use 4-ounce E-glass that comes in 42” wide rolls and is cut to the correct length and width once it is rolled on the board. Do not try and use 30″ cloth that is the standard cloth size for surfboards, as you need enough cloth to wrap the rails. You require a length of glass twice the length of your board plus 2 feet. This will give you 6” of extra length at the nose and tail on both the top and bottom layer. Fiberglass is measured by weight per square yard for the glass only. It might seem like a minor difference jumping from the 4 ounce glass that is recommended to 6 ounce glass for a stronger board but remember this is the weight of the glass only and not the weight of the epoxy required to fill it. The finished weight of the board will be substantially heavier with a heavier glassing schedule since the weight of the epoxy resin is a large percentage of the overall weight of the finished board. If you are a really big guy, and worried the board’s strength, consider doing a “deck patch” just under the standing area with an extra layer of 4-ounce cloth. The finished board will be stronger where needed and lighter overall than wrapping the whole board in 6-ounce cloth. I have never done a deck patch but since I use wooden reinforcement ribs under the standing area but it is standard on foam boards. If you decide on doing a deck patch laminate both 4-ounce layers at once by laying the deck patch down first and then your full-length layer overtop. The board in this tutorial received a cheater coat to seal the grain before the real glassing started. The lamination coat and the hot coat were completed on the top before the board was flipped and the steps were repeated on the bottom. This was done because my time schedule allowed me to get two coats on and not because it is better than stacking the last two coats. In an ideal world I would laminate both sides, install my inserts, then do my fill coat and gloss coat. The only benefit to doing the coats this way is the weave is filled when you install the inserts and cannot fill with dust. The downside is it is harder to trim your excess glass as it has two coats of epoxy. 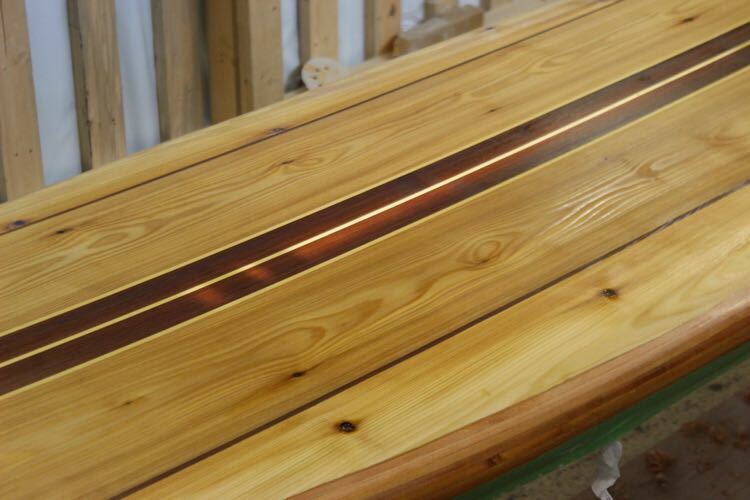 The term “Hot” coat is used when the next coat of epoxy is going on with the glass uncured from the last coat. The important thing to remember is the board will receive 3 coats of epoxy. The glass cloth goes on with the first coat. Any two coats of epoxy can be applied without sanding as long as they are timed correctly and the glass is still green (uncured). The inserts should be installed before the final gloss coat. How much fiberglass and epoxy are required to glass a wooden board? It will take less than a 1.5-gallon kit and most likely more than the next smaller kit. Your best bet is to buy a 1.5-gallon kit knowing ahead that you will have some resin left over. Epoxy stores forever and having to buy a second small kit will cost way more. 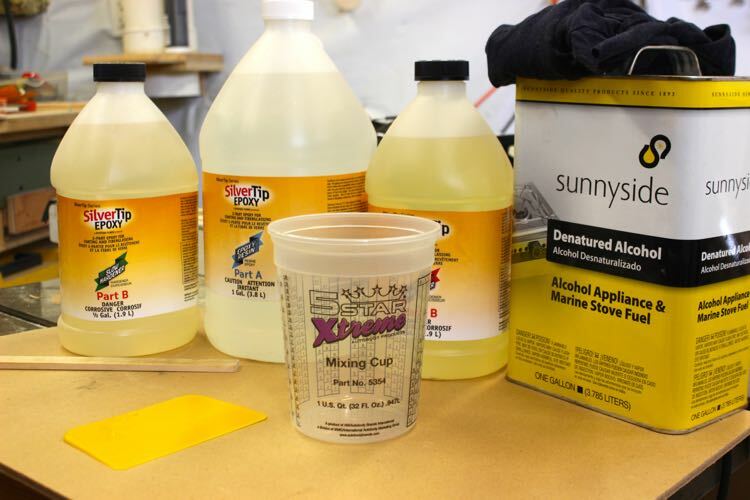 As long as epoxy is not mixed so you do not have to worry about shelf life. Even epoxy that has hardened in the jug can be reheated and used without problems as long as it isn’t contaminated. Epoxy behaves much like honey before it is mixed and some brands crystallize to a solid in the container. I accidentally threw out jugs of epoxy thinking it was unusable after it hardened in the container. I now know that a hot water bath with turn that unusable looking solid back into perfectly useable resin. What weight glass should I use on a wooden board? Use 4-ounce E-glass. It comes in 42” wide rolls that are perfect for paddleboards and it is cut to the correct length and width after it is rolled on the board. Fiberglass should be rolled or specially folded to prevent stressing the weave so try to buy local if you can. The 30″ cloth that is standard for surfboards is too narrow for paddleboards so go bigger if your supplier doesn’t have the right width. You will require a length of glass twice the length of your board plus 2 feet. This gives you 6” of extra length at the nose and the tail on both the top and bottom layer. Fiberglass is measured by weight per square yard for the glass only. It might seem like a minor difference jumping from the 4-ounce glass that is recommended to 6 ounce but remember this is the weight of the glass only and not the weight of the resin required to fill the weave. The “E” designation specifies the weave pattern so make sure you are getting style #1522 if E-glass isn’t the local term. Is “Insert Brand Name” a good epoxy? There are many great epoxies on the market but I have only used a few different brands. In reality every brand has slightly different quirks and curing schedules and once you know them you will think it is great. I currently use SilverTip Epoxy from System Three. SilverTip is more expensive than the other brands I have used but it is easy to achieve excellent results with it. Resin Research is the surf industry standard but it is slightly quirkier for homebuilders and possibly not quite as clear? MAS epoxy & Entropy have good reputations in the wooden board world as well if you are not on the West coast.